But, to quote Microsoft now: Once an MVP, always an MVP! So I’m now proud member of the MVP Reconnect Program. This will allow me to stay in touch with the community and be able to have, among other benefits, an “Exclusive engagement opportunities with Microsoft headquarters and subsidiaries” (no clue what this concretely means J ). But overall, that’s also an opportunity for me to do something else. When I do something I’m always obsessed, so I will find another hobby and share it with my readers (if any). For once, a short article with a quick tip on how to enhance the Track your work web part, on your Project Online home page, by updating some links and changing the colour of the tiles. Project Online (or Project Server) should be configured, not to say customized, in a way that it supports your business principles and procedures around Project Management. It should reflect your (probably tailor made) Project Management methodology. The first thing you generally do is to configure your way of doing project plans, by creating your own Enterprise Custom Fields and Lookup Tables that would be used together with your custom views. The implementation relies on the usage of SharePoint Content Types. You can find more information on this topic reading: Introduction to Content Types on MSDN. Content Types, being centrally managed, can be easily updated to reflect your methodology changes, and those changes can be applied to any existing Project Site (avoiding to ask you poor dev team to manually update all project site lists after any changes). The trick is to update the existing Risk or Issue Content Types (or create your own), understanding that Project Online relies on some fields of those content types. It means that you should never delete any of the existing fields. If you remove some fields (aka the trap of the beginner), the publish process may throw an error. Even for SharePoint dev superheroes, it’s very complex to recreate those fields (it’s not just a story of recreating the fields with the same names). You cannot delete fields, but you can create new ones or hide some of the existing. If you are not familiar with this, here is a step by step procedure to create your own Issue Content Type and use it in Project Online. The status manager is the resource who is to receive status updates for a task, from any resource assigned to this task. The Status Manager (task field) is described in this page from Microsoft support. Microsoft Project has a limitation that prevents a schedule owner from setting a task’s status manager to anyone except himself or herself. Hence, if you want to assign another person as the Status Manager to a task within your project plan, you need to ask him/her to edit the schedule in Microsoft Project and assign himself or herself as the Status Manager. Applied to Project Server (2013 +) or Project Online, ProjectData is the OData service, implemented with the OData V3 libraries, which allow to query project data. You can access the ProjectData service through a Project Web App URL. The XML structure of the EDM is available from the http://<pwa_site>/_api/ProjectData/$metadata. This article will describe all the necessary information required to understand how to manage master projects and subprojects within Project Server. Note that the approach is similar with project Online. And I will use the delegation feature to illustrate what other users will see when using the tool. So, what is Office 365 Planner? Microsoft positioned Planner between applications such as Wunderlist (acquired on June 2, 2015) for task management and PPM applications (Project Server or Project Online). 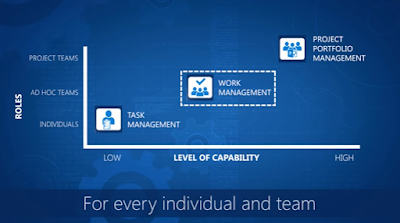 Illustration from Microsoft Mechanics YouTube channel.